Is it in anyway related to the books?? I agree wif anonymous1 its a trumpet. It's the Tristero's horn from The Crying of Lot 49 by Thomas Pynchon. So I'm guessing you think it's the Tristero? A secret society from the book above? hmmm... I thought it looked like a cannon. 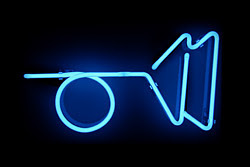 "Pynchon created the "muted post horn" as a symbol for the secret "Trystero" society in The Crying of Lot 49." Ok, I looked on wikipedia, but here it is: underground mail service known as "The Tristero" or "Trystero,". It's from the book "the crying of lot 49" by Thomas Pynchon. Boy you guys are good! But it looks as if Raph was the first person with the right answer!!! Congrats, Raph! I'll be in touch. Ahhh, no fair!! What book is that??! Lol. Good job, though, guys! -.-' I have no clue what that is... Congrats Raph! I thought it was a hammer and a rubber bouncy ball, so I was like "o.e What in the world is that?!?" By the way, THANK YOU THANK YOU THANK YOU. So much. I've been really sick with sinusitis lately, and this really made my day. (: Thanks, Kirsten. You, Ananka and everyone else never fail to put a smile on my face. Congrats Raph! 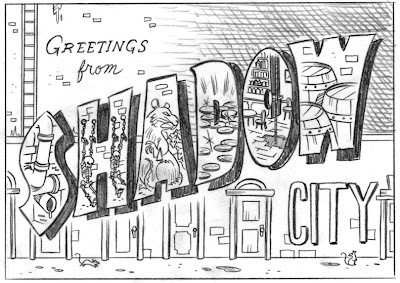 Is the "greetings from the shadow city" drawing meant to be a postcard? It's great! How on earth did you research a picture? I have wanted to read the hitchhikers guide to the glaxy! Maybe it's the aliens. THey do that sort of thing a lot. Jin Ai: I didn't research the picture. xD I kind of researched what the picture was. Man, I wish I got that one. I so wanted a free shirt! Oh, and I hope you feel better, Raph. I really want a free shirt it is my brithday in a few days can I have one? cool! i love stuff like that. oh, and i have no idea. it looks like a neon light, if you ask me. a blue one, to be xact.